The Rivers State Chapter of the All Progressives Congress has once again accused Governor Nyesom Wike of complicity on the soot which has continued to pollute the State, vowing that she (APC) will stop all illegal refineries and associated tools that cause soot within six months of assumption of power in 2019. The APC in a statement by Chief Eze Chukwuemeka Eze, the Media Consultant to Dr Davies Ibiamu Ikanya, the State Chairman of Rivers APC noted thus: “The other day, the Governor of Rivers state, Chief Nyesom Wike, in his dramatic pattern, accused the Federal Government of plotting to exterminate the Rivers population by encouraging activities that will sustain the dark, dangerous and mortal cloud on the State capital, which has become known as the dangerous soot. He backed his emotional hypocrisy with a lot of lies, but what is not lost on the free mind and those who are not caught in the politically motivated emotional blackmail is that the Governor knows more than he has told the world. Dr. Ikanya stated that it has come to the notice and understanding of the All Progressives Congress (APC) in Rivers state that the so-called crocodile tears of the Governor is just a decoy. “Reliable discoveries have revealed that the Governor said all he said to buy cover for a well organized illegal activity going on under his nose” Ikanya said. The statement reads: “Governor Wike knows that the deadly cloud over Port Harcourt is undoubtedly from illegal oil refining, which has been termed as ‘kpo fire’. He knows the leaders of the groups involved in this dangerous illegality, he knows them from the race to the 2015 election and he very well knows what this is all about. The blame on the Federal Government was a mere façade. We call on Rivers State Governor, who happens to also be the Chief Security Officer of the state, to call his boys off so we can have a clean, soot-free environment. 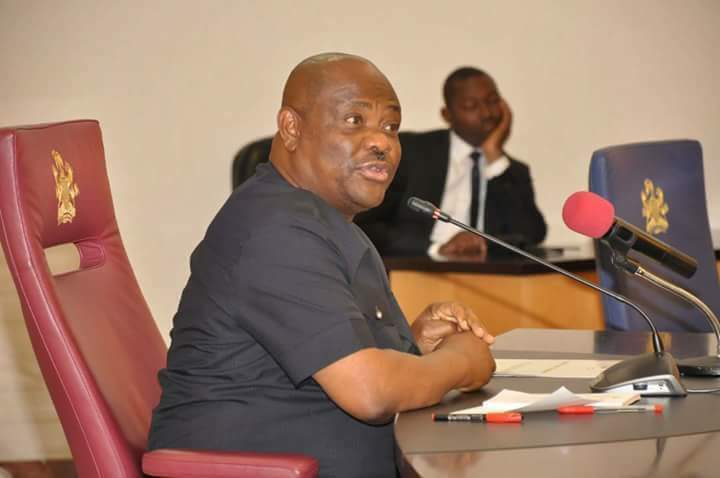 “For the avoidance of doubts, the ‘producers’ of the dangerous cloud over Port Harcourt (soot) are Wike’s boys, whom they used to execute the 2015 elections and they have kept in a sort of security immunized zone so that they can make enough money to buy the arms and ammunition they will need to prosecute the 2019 bloodbath, since they won’t have the ‘federal might’ to fight personal wars as they used to. “The APC in Rivers state, therefore, calls on the Governor of Rivers state to be compassionate and spare the innocent children, women, youths and men of the State capital, who do not have the sort of protection as he does, to call his agents of death off from their daily cooking of illegal crude. They should stop killing us all even before the elections come.” the party pleaded. The party however commends the Federal Government for her concerted efforts in finding the causes of the soot and how to curtail its menace in Rivers State but reiterated that any effort without Governor Wike collaborating and assisting to call his boys to stop this evil act of operating illegal refineries will be an exercise in futility the party. The party warns Wike to toe its line of plea for peace and sanity and avoid the plots to destroy the lives of Rivers State people because of elections as such plea should not be taken as the rattling from a disadvantaged body but as a wise counsel to prevent him from turning the State into a worse situation as he did before, during and after the 2015 general elections when he turned the State into a battle field were hundreds of innocent souls of Rivers State people were lost in the bid to install him (Wike) as the Governor of Rivers State. The party cautions that the 2019 general elections will not be a repeat performance of 2015 general elections where he used the militants to execute his evil plots against democracy and good governance in Rivers State the party concluded.